Motherhood is the most significant role of every woman, as believed by 76 percent of senior year girls from specialized and arts and humanities high schools, who are positive that a woman is fulfilled completely only if she becomes a mother. Aside from being firm believers that a woman valued only if she meets her biological function, even 95 percent of girls turning 18 are all for “sacrificing parenting model”, i.e. they think a mother should sacrifice all for her children, as shown by the latest survey, titled “Analysis on correlation between gender stereotypes and gender-based violence”, conducted by the non-governmental organization “Atina”. The survey was conducted in Belgrade, Vranje, Novi Pazar, Kikinda and Jagodina, and data was collected through questionnaires filled out by 18 and 19 years old high school girls. As emphasized by Jelena Hrnjak, program manager of this non-governmental organization, due to the conviction that a girl should tolerate everything for the sake of the family, the biggest number of them would neither report violence in practice, nor abandon the aggressive partner. Moreover, the highest number of girls (do not) acquire verbal and nonverbal knowledge on gender equality in their respective families. – An illustration of the claim that geography affects psychology are also (different) attitudes of girls from Novi Pazar on gender equality. Namely, every fifth girl from this town believes that it is a man’s responsibility to make money, while it is a woman who takes care of the household and family. Every fourth surveyor thinks that the fact that a woman earning more than a man almost inevitably causes problems in a marriage. Claim that a mother’s fundamental role is to be a housewife, while a father is to be a breadwinner, is mostly endorsed by the girls from Novi Pazar, which depicts that a patriarchal organization in this town is a dominant family pattern. In other towns from the sample the number of girls who agree with this claim is by far smaller. 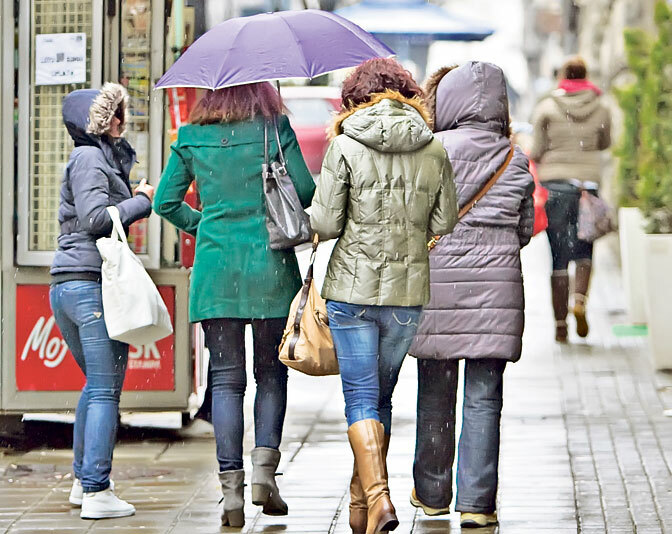 In addition, the girls from Novi Pazar are more commonly in agreement with the claim that a man should be dominant figure in the family, unlike two-thirds of girls from Belgrade, Kikinda, Jagodina and Vranje, who disagree with this point of view – underscores our interlocutor. Encouraging information, adds Jelena Hrnjak, is that a majority of girls believe that control and jealousy in partner relationships are not expressions of love. Almost the same number of girls, i.e. two-thirds of the surveyors, is in agreement with the attitude that a girl who wears tight shirts and short skirts is not the one to blame if she is raped. When it comes to poverty as one of the causes of violence against women in Serbia, the opinions of surveyors are divided – one-third of them believes that destitution is a cause of domestic violence, while a bit higher percentage of girls has opposing point of view by not seeing poverty as the cause of it. The highest number of surveyors – even 92 percent of them, agreed with the claim that equality of women and men should be one of the top priorities in our society. However, girls showed interesting attitudes about women’s involvement in political arena. Namely, only every third surveyor believes that there would be less problems in the world if there were more women in politics, while two thirds share the opinion that men are not better political leaders than women, says Hrnjak. – When we asked girls about their professional role models and where they see them themselves in the future, the majority of them responded that they see themselves in so called show business professions – fashion, modelling, music and acting. Medicine and sport come fifth. This is not surprising due to the fact that our surveyors are so called Instagram generation, that find it extremely important to be seen and recognized in public. Regardless of that, the biggest number of girls see women who affected their upbringing and education as their role models, such as their mothers, nursery school teachers, teachers, professors – underscores Hrnjak. Among names girls mentioned as their role models are also models Adriana Lima and Sofija Milosevic, as well as a fashion designer Donatella Versace. As for art, girls have recognized singers Nina Simone and Demi Lovato, pianist Lola Astanova, musicians such as Eric Clepton, Matt Corby, John Mayer and John Frusciante. When it comes to actresses, girls picked Sandra Bullock and Eva Longoria. Most common role model of girls in sport is a tennis player Novak Djokovic, athlete Ivana Spanovic, handball players Cristina Neagu and Andrea Lekic and volleyball player Stefana Veljkovic. Author: Katarina Djordjevic; Tuesday, 25.12.2018.